We do property evaluations and budgets that make it easy to get work done. We respond immediately to your emergency calls. This is the removal of dead, diseased, broken and hazardous limbs. 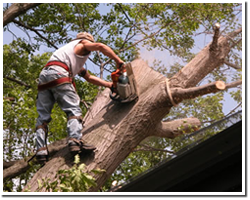 This lessens the risk of branches falling from the tree and reduces the risk of disease or decay traveling from dead or dying limbs into the rest of the tree. This is the selective removal of limbs to supply upright clearance. This is done to supply clearance for ocean, bay and canyon views, buildings, signs and pedestrians. This is the selective elimination of limbs to lower the height and lessen the width of the tree. This is done to clear utility lines, clear vegetation or to improve appearance. We believe in leaving your yard so clean that the only evidence of our being to your home is your beautifully manicured trees. This is a service provided to grind the stump of the tree 10 to 18 inches below the ground and to grind visible surface roots as well. The chips/dirt are left in the hole. Our trained professionals are on hand and available to you when you need more then a free estimate. Advice is available on any size job. 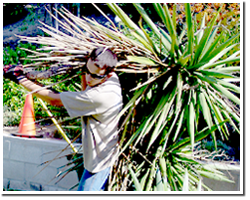 Clear your property of brush to 100' from the house or to the property line on all sides, whichever is closer. This does not include plants and bushes that make up the landscaping around your house. 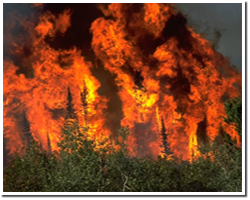 Brush fire spreads rapidly from the ground to the trees if there is an abundance of undergrowth. Clearing the brush will add value to property by providing a buffer of defensible space and will keep your property attractive and looking well maintained. So you won't be left out in the cold if a situation occurs after business hours. We are fully licensed and insured. In urban or suburban neighborhoods, trees and shrubs often need fertilizing. Modern home-building methods create adverse growing conditions for plants. Often, good topsoil is completely removed and not replaced. Plants are crowded by streets and sidewalks, and must compete with grass for nutrients. Proper fertilization is especially important to trees in this type of environment. This is done when the tree is dead or dying; it has uplifted sidewalks, grown too large for the area or is too close to the foundation of a property. Some trees may be removed due to re-landscaping or because it is aesthetically pleasing. Our trained professionals understand how each tree species will react to different types of treatments. Most regular tree trimming can be done at any time of the year. Pine trees and fruit trees should be pruned in the fall/winter.